Nothing frustrates me more than visiting someone’s house and seeing their beautiful kitchen, decked out to the nines, and stocked with the latest pristine, unused cookware. I compliment them on it, and the person says, “Oh thank you. But I never cook.” What a waste of good tools. On the other hand, I also see the kitchens of people who really love to cook but don’t have the right kitchenware, which is also frustrating. I think to the words of the great comedian, Eddie Izzard, who said “‘Guns don’t kill people, people do,’ but I think the gun helps, you know? I think it helps. I just think just standing there going, “Bang!” That’s not going to kill too many people, is it?” Having great tools isn’t going to make you a great cook, but it’s certainly going to help make cooking a more pleasant and successful experience. 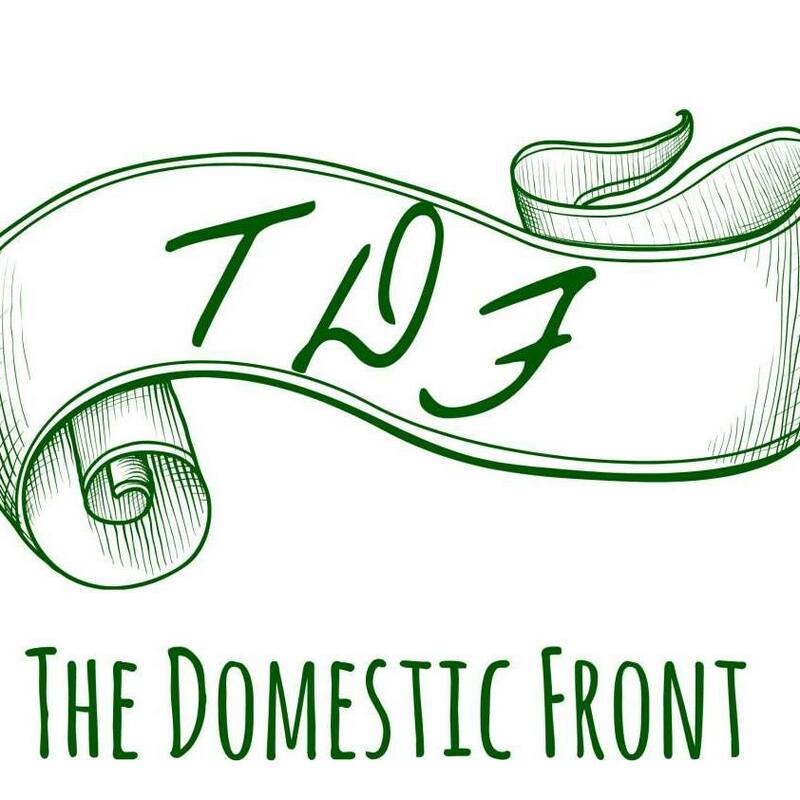 That’s why I wanted to write a series of posts about the tools and cookware in my kitchen that I just love. If you’re looking to buy some new kitchen accessories, or you’re building a wedding registry or equipping a new kitchen, I hope this guide will give you some ideas of what kinds of kitchen tools would be useful. I’m starting the series with the backbone of the kitchen — pots and pans. Of all the pots in my kitchen, my Le Creuset french ovens are the most treasured (which is why they feature so heavily in the design of this blog.) They cook evenly, clean beautifully, and work in the kitchen or on the table with equal aplomb. I have 4 different french ovens in 3 different sizes, but of all of them, the oval 3.5 quart gets the most use. I use it for everything from making stew to baking bread, boiling pasta or making caramel. The oval shape will fit a small roast or chicken for braising, and the 3.5 quarts is the perfect size for a small family. 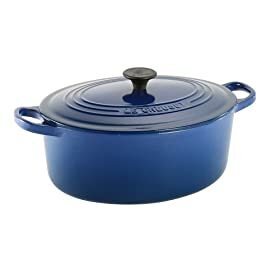 There are several brands of enameled cast iron on the market, but I am loyal to Le Creuset — the craftsmanship is excellent, and the light interior is incredibly useful when you’re judging the color of sauces or caramels — something that would be impossible in the more common black interiors. If you’re registering for a wedding or looking to upgrade your kitchen, this is what I would get. Glass dishes like these are the real workhorses of my kitchen. I have two — the larger one is perfect for larger casseroles, sheet cakes, and roasts, and the smaller gets pulled into use for brownies, vegetables and even gratins. They clean easily and look nice enough to be used as serving pieces. Calphalon knew what it was about when it Christened this pan the “Everyday Pan” — this pan comes out all the time. It’s moderately nonstick and can go from stove to oven — I use it for frittattas, casseroles, gratins, and braises. 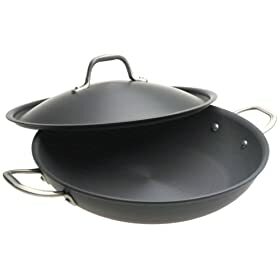 This is the pan that stands in for a wok in my kitchen, and the large size, combined with the lid, makes it incredibly versatile. 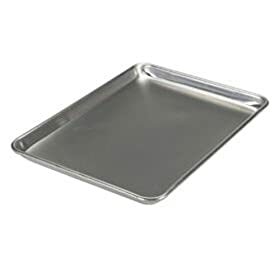 I used to have any number of different cookie sheets — nonstick, those funky air pans, pans with different sizes and shapes — but once I tried a commercial grade aluminum half sheet pan I was sold. These things are solid and heat evenly, which means your cookies will cook better and more evenly. They nest nicely and can even be used to make a roulade cake if you’re braver than I am. Cook’s Illustrated did a test years ago that said pies browned better in a glass pie plate than in a metal one, and far be it for ME to contradict Cook’s Illustrated. A glass pie plate also looks nicer and is more multipurpose — you can roast small amounts of vegetables in it, or bake a single chicken breast. It’s also an excellent cover for a bowl if you want to steam vegetables in the microwave. See? A real multitasker. Oh, my cast iron skillet, how I love thee. The virtue of a cast iron skillet is that it gets Really, Really hot, so it’s pretty much essential for cooking something like steaks indoors. It also goes from stovetop to oven, so you can use it for searing meats and finishing them in the oven, and of course, what would cornbread be without a cast iron skillet to cook it on? People get intimidated by the seasoning process, but it’s just created by hot fat — if you roast a few chickens (I always roast chickens in a cast iron skillet) and fry some bacon in your skillet, it will be seasoned plenty quickly. 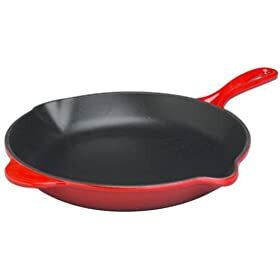 The one I have is the Le Creuset one pictured — because it’s enameled on the outside, it’s not subject to rust on the less seasoned surfaces, but if your budget won’t stretch to that one (mine was a gift) you can also get the Lodge 12 inch cast iron skillet , which is one of the best cooking values out there. 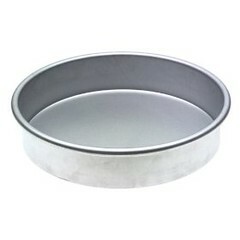 If you’re going to make a layer cake, you’re going to need a cake pan, and a 9″ is the standard size for most recipes. A lot of the cake pans you see have sloping rims, which makes the pans easier to store because you nest them. However, if you try to stack two sloping rimmed cake layers, you end up with a big fat mess (or a lot of trimming). A straight sided pan, like these inexpensive ones, is the first essential step in making pretty birthday cakes and layer cakes. Ramekins are the jack of all trades in our kitchen. They get used as prep bowls, custard cups, individual souffle cups, pudding cups and even cereal bowls. There are some things that are too dangerous to make big servings of, and that’s where ramekins are essential. Do you agree with this list? Disagree? Think I’ve left something out? What are your favorite kitchen cookware? I would also add the cast iron comal. It is a standard in any household making Mexican food. Used primarily for making corn or flour tortillas, but it is also great to roast/blister chiles, make fajitas, quesadillas, etc. I have most of the tools you listed. I just really want/need? a Le Creuset casserole dish. I enjoyed this list. I love looking at and purchasing kitchen tools. Kate: I love this post! As soon as I read one part I wondered is she gonna mention…..and there it was. You covered the basics here in great detail. I share the same passion for these essentials. There is nothing like those commercial grade aluminum sheet pans. The only other thing I would suggest with those is a Silpat companion. I roast my veggies, nuts (everything) on those, and baking is much more precise. I do need a cast iron skillet, I will take your recommendation on this one. Le Creuset is wonderful, I love my Flame 3.5 quart dutch oven. 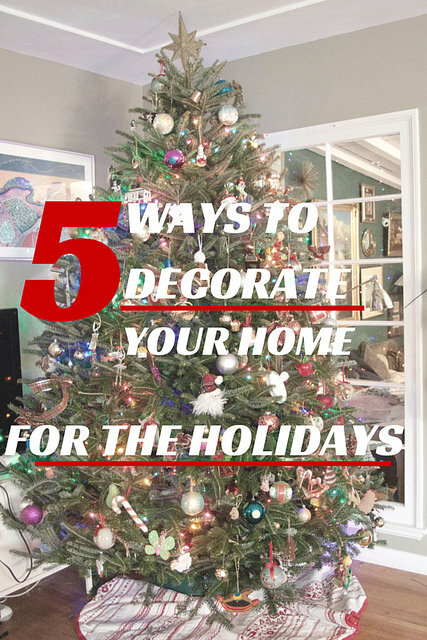 You are right about the interior color. Little white ramekins: help control portion sizes, kids love ’em and they are so cute! I still remember when my darling husband dropped by 7 qt Le Creuset and it broke clean into two pieces. After making sure he didn’t shatter his foot, I cried. He replaced it the next day…that’s how important the pot was to our daily use. I will add, though, that I love my Le Creuset cast iron 9×13 baking dish. 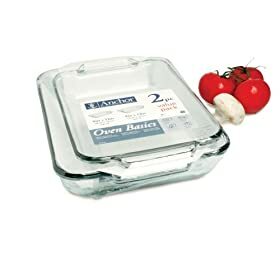 Not an essential, I agree, but for the few casseroles where a crisp bottom in sought after, nothing substitutes well enough. I couldn’t agree with you more – either friends have stunning kitchens, but don’t cook, or they do cook, but use archaic kitchen equipment that should have been thrown away 20 years ago. I cannot understand either situation! We don’t have a dutch oven. I have been using one of those stock pots from the dollar store for everything from a spaghetti pot to a chicken roaster. We have a pie plate, but I can’t recall ever using it. Though I suppose that it’s possible to live without them, I’d add a few things. Measuring tools, mixing bowl, loaf pan, food storage containers, crock pot, and two good sharp knives. I totally agree on your list. My cast iron skillet gets the most play in my kitchen. I actually get excited every time I use it. 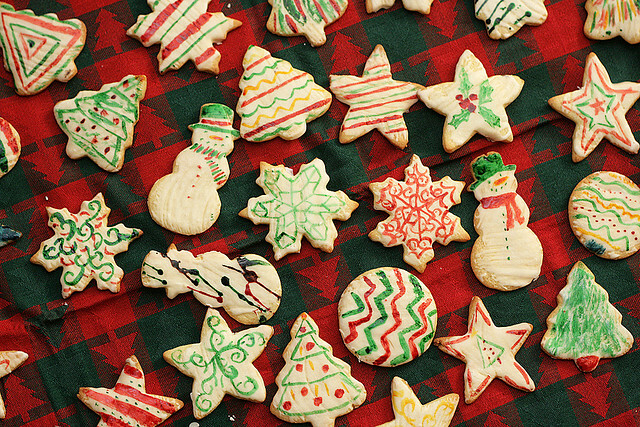 Somthing I love (but probably could live without) is parchment paper. It makes life so much easier. Oh and always having a bottle of wine…. AND! a a kitchen journal to make notes of what worked, what didn’t, likes and dislikes. Every one should keep some sort of notes in the kitchen. What a great list – and I agree with every one. I also like that, for the most part, you don’t include the highest-end product in each category. 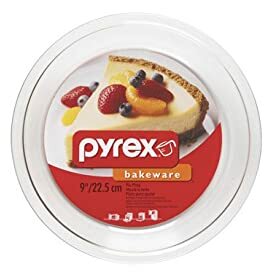 For instance, those Pyrex pie plates are fab, and cheap – Cook’s Illustrated rated those the best of all. On the spendier side, my 7 1/4 qt. Le Creuset gets SO much use – sweet, savory, soups, braises, apples for apple pie, melted chocolate and Cheerios for little candies at Christmas. And my cast-iron skillet (I have a Lodge and it’s great, too) is my #1 go-to skillet – when seasoned and heated properly – it’s virtually non-stick! I agree with almost everything on your list, and the other things I want to try! (Aluminum half-sheet pan, you call to me . . . ) I just want to correct you on one point – the le creuset cast-iron skillets are enameled on the inside. most people think they aren’t, because they use a black enamel rather than the white interior in the french ovens. As a result, it doesn’t need to be seasoned the way a non-enameled cast-iron pan would be (eg. Lodge), and why you’ve had good results ‘seasoning’ it with cooking bacon and a roast chicken. A raw cast-iron pan would need the full seasoning process of hot fat baked onto it for several hours to achieve a true patina. I think I’ll have to start a little wish list. If you can find one and afford it, I would get an old Griswold cast iron skillet. The Lodge ones are pretty rough textured (sand cast I believe?) but my old Griswold is as smooth as silk. Best Christmas present ever and most used pan in our house. I totally adore this post! Thank you for sharing your kitchen essentials! I love my dutch oven, but I don’t own a Le Crueset. Instead I purchased a dutch oven from the Lodge company which Alton Brown mentioned on one of his shows. Just as good as Le Crueset and cheaper too. Hi Kate – I recently started following this site – and am enjoying it. can I ask questions here? 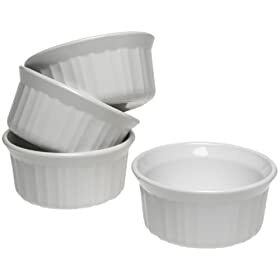 because I am having a little bit of a heartbreak surrounding my Le Crueset….my husband accidentally turned on the wrong burner and the one he turned on had my empty, (with lid on) 3.5 quart baby with the little rubber protector thingies on – so they melted and burned inside of her . Now there is a smoky greyish color on my enamel and a darker black spot right on the bottom. He tried to get it out but is scared to ruin the enamel. Any idea how to get it back to its original state? i love that cast iron skillet. i’d add a box of corningware. great for refrigerator storage and you can do everything from bake a soufle to roast a chicken in the larger pieces. fave new kitchen pan is my green pan from hsn. doesn’t stick but sears way better than traditional non-stick. love! Great post! 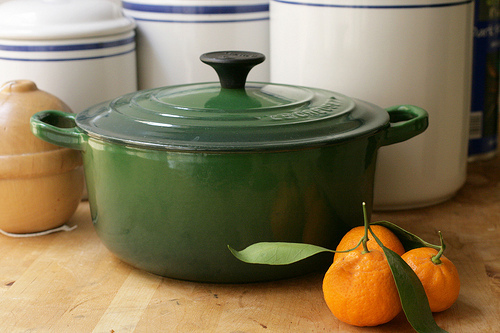 I also love my Le Creuset Dutch pot and use it constantly– especially this time of year. Thanks for the tip on the aluminum sheet pans. I’ve been unhappy with my random assortment of cookie sheets for forever but have been reluctant to upgrade to the super pricey ones you see at Williams Sonoma and Sur La Table. At $15 a pan I think I can toss out the old lot and start anew. Don’t own a cast iron skillet. I tend to use my big Calphalon saute pan for all my stovetop-to-oven dishes. Hmm… maybe I should look into cast iron. Great post Kate! I agree with just about everything you said here. I don’t have a wok and need one and now think I will buy that Calphalon pan. What a great idea and totally multi-purpose. Thank you for telling us exactly what size of each you use! I have been looking into investing into a La Creuset french oven for awhile now (I own everything else on your list – all essentials!! ), but didn’t know what size I should get for my first one. Now I know! Thanks so much!